great pics! it’s been cloudy the past couple nights where I live but on Sunday I got to observe Jupiter in my 10″ Dob for the first time. 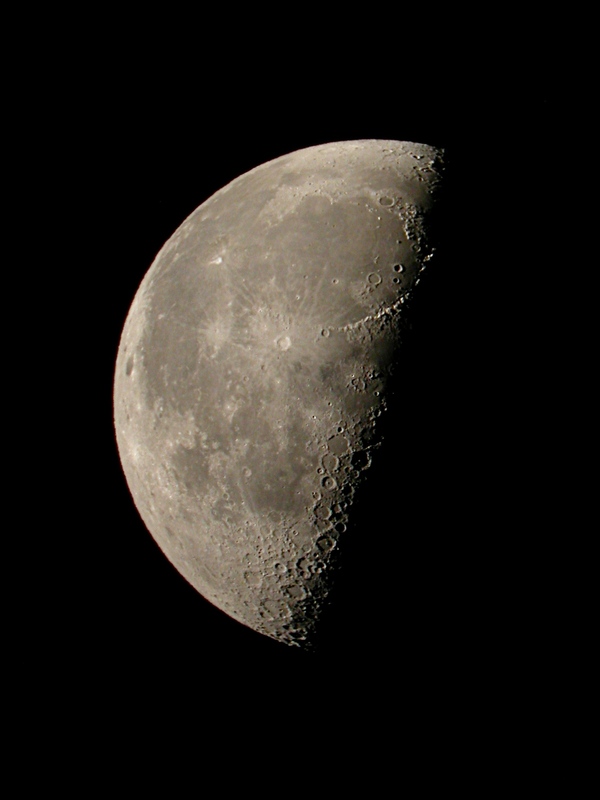 For the moon picture did you use a filter on your eyepiece or did you make an adjustment on your camera? Thanks for the kind words. I know some folks think of a 10″ Dob as a deep-sky vehicle, if it’s in collimation it makes a wonderful planetary scope, too. 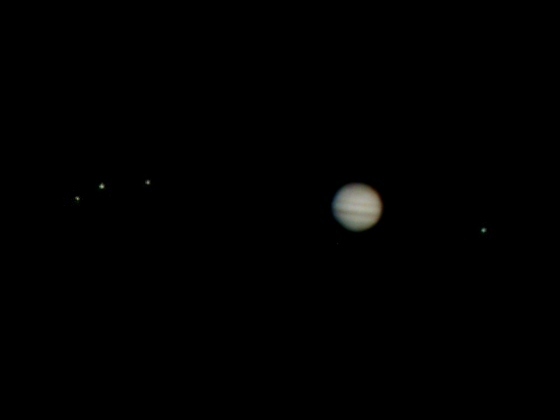 The detail I’ve seen on Jupiter on nights of good seeing in my 10 has been jaw-dropping. I didn’t use a moon filter for the pics, just set the camera exposure to something short, either 1/60 or 1/125 of a second. I have a variable density moon filter, but I hardly ever use it. It’s not helpful for digiscoping–the way to handle a too-bright moon is to shorten the exposure time, which has the added benefit of alleviating any blur caused by shaking–and I don’t really like the effect visually. The filter basically flattens out the contrast, and I’d rather have a painfully bright but contrasty image than a more comfortable view of a flatter one. IMHO and YMMV, of course–I know a lot of people swear by their moon filters. cool stuff. i wish astrophotography was feasible for me but my budget is small 😦 be sure to take a pic of the Venus transit in June! Whoa! That does not have to be a barrier! Note that all I did here was hold my point-and-shoot camera up to the eyepiece and snap away. It’s not a fancy camera–not a DSLR, and more than a decade old at this point. People have even gotten good results with the cameras in their cell phones. In fact, Orion now sells a gadget for holding an iPhone up to the eyepiece. It hasn’t gotten stellar reviews, but its very existence shows that low-budget astrophotography–at least of the moon and planets–is very achievable and that lots of people are doing it. If you’d like a step-by-step tutorial on how I do it, see this post. Clear skies! “White-trash astrophotography”. Ha! A classic. I just posted in your Targets of Opportunity (borrowed from WW II Bomber Command?) musings on bargain small Maks. Now I find this section on Astrophotography for Everyman. Just great stuff! As I said in my other post, I’ve been at this but 5 weeks or so and was thinking that maybe, someday, way down the line, like years, that I MIGHT try my hand at astrophotography. Now you tell me I can handhold my digital camera at the EP and shoot away. I had no idea, thought astrophotogging was hopelessly complex and required a pricey DSLR and various other accessories, yet here you post some really, really nice shots (the Jupiter/Venus/Moon triad is framing-worthy) taken with a handheld Cool Pix. Who knew? Not me. The next clear night we have here in Oregon, perhaps mid-April, I am going to take my Casio digital camera out and give it a shot, see what I come up with. Your blog is a tremendous resource. Must-know info presented by someone who knows what he’s talking about and laid out in a casual, chatty conversational style which makes for enjoyable reading. Thanks for doing this. I plan to be a regular visitor. Wow, thanks for the kind words! I’m glad you’ve discovered astronomy. Sorry to hear that clouds have been getting in the way of observing. We’re even getting some of that down here in SoCal. It was supposed to be perfectly clear tonight and instead we are completely socked in. Anyway, glad you’re enjoying the blog. As you’ve probably seen by now, I tend to use the comment fields to have long conversations with folks, so feel free to stop in and share your thoughts and questions whenever you like.